Each week I drag home more and more dishes from yard sales. 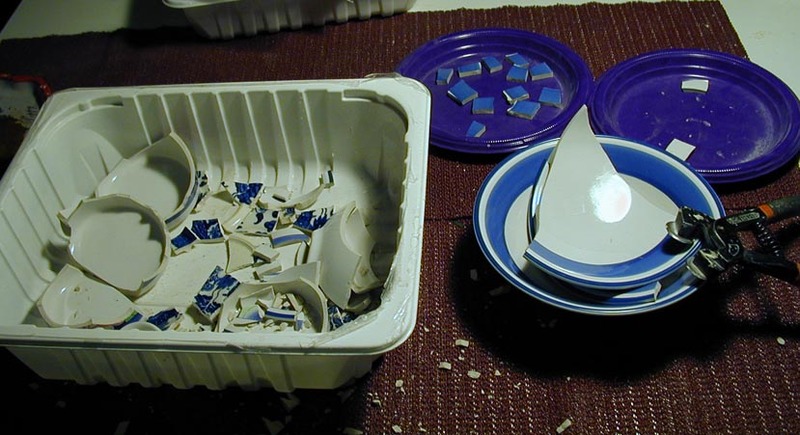 Which mean, I periodically run out of room to store these dishes ...... So, have to call a "breaking glass" day. 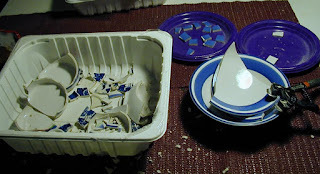 Dishes are brought in from the garage storage shelves (when you do mosaics, you have things stored in every imaginable corner), broke with cutters and sorted into plastic ziplock bags. They are then put back into storage containers by color for use in future projects. I usually max out on this at 4-5 hours, as even with gloves, I get blisters on my hands.